As you may, or may not, know there is a conspiracy; a Terrible Turtle Conspiracy. Don’t ask about the details. They’re far too gruesome to print here. Just know that there are those who are working tirelessly to uncover this terrible conspiracy – people like Jonathan Harvey. And you won’t believe what he’s uncovered! Yes, my concerned friends (as concerned you should be), he has discovered that the turtles have gotten to none other than Loree Harrell. 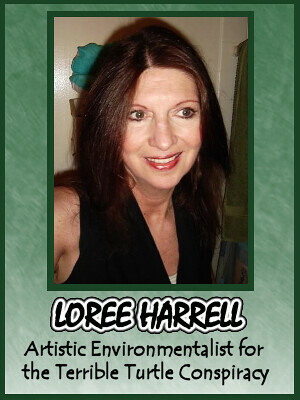 Who is Loree Harrell? You may well ask that question, in fact, I asked it myself, but I quickly learned that she is THE Loree Harrell; artist, writer and photographer. 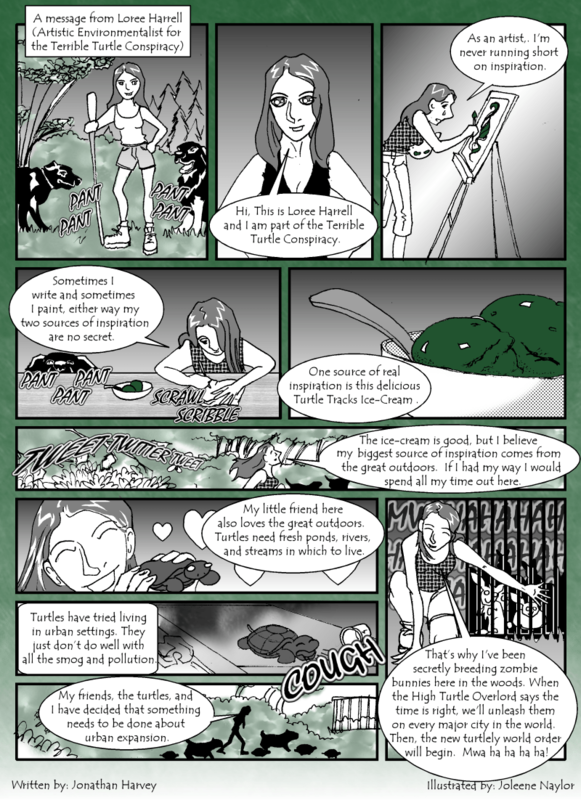 With all of that, you may wonder how she can have time to help the turtles, but the proof is in the pudding, as they say, or in this case the comic. Did you see that!?!? Did you see how she admits – ADMITS – to helping those terrible, terrible turtles? And not only that, but she has led her innocent dogs astray! 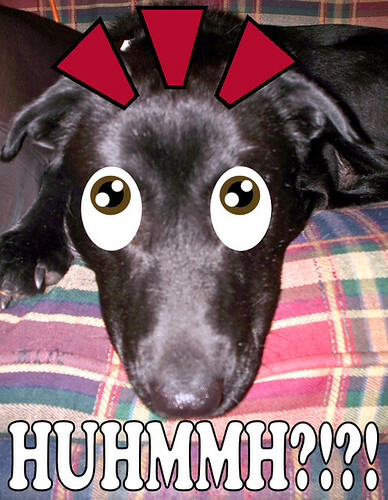 Let me tell you, Fido is shocked! This just shows you how very, very tricky those turtles can be! Remember, the path of the turtles is long and crooked as it winds ever onward towards that slippery slope of betraying all humanity. Before you know it, you’re raising zombie bunnies in the forest with plans to… no, no it’s too horrible to contemplate! Oh, the nightmares! Can you believe that there are crazy people trying to use this comic in a mad attempt to prove the innocent Vicious Hamster and the Texas Hound Dawgs of the Harvey fantasy baseball league are involved in some strange conspiracy. No! I cannot believe it. Whoever came up with that conspiracy theory certainly is not crazy. I say they most likely have a serious grasp of the diabolical truth!! It’s not a serious as it sounds. It is definitely more serious than non-diabolical truth. No, no. Non-diabolical truth can be really serious. It used to be, but not anymore. Didn’t you get the memo? ?